Batman’s rogue gallery may very well be the most beloved in comics. Also, it’s enormous. 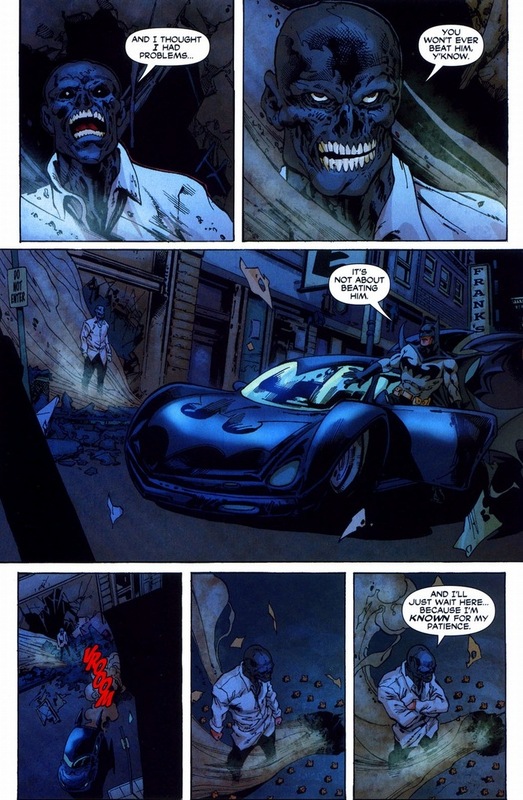 Black Mask, while not known to casual fans, has been around since 1985 (eight years before Bane) and during the 2000s, he becomes the undisputed ruler of Gotham’s criminal underworld. 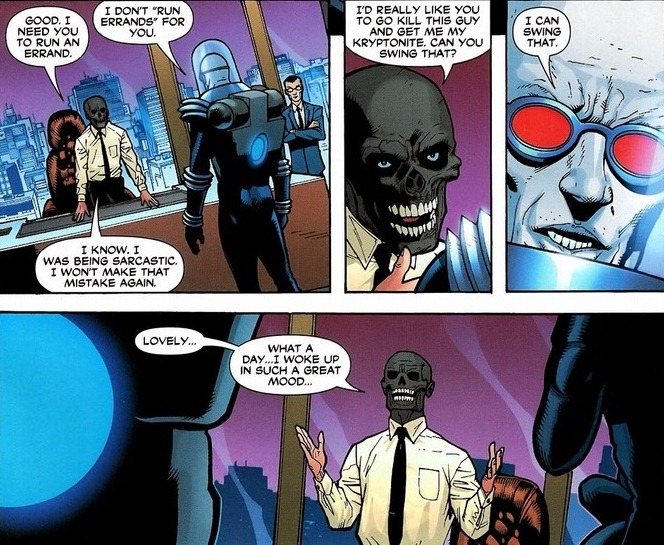 Black Mask (real name Roman Sionis), like most of Batman’s villains, has no superpowers. Born to miserable socialites, Roman develops sociopathic tendencies and eventually turns to crime. 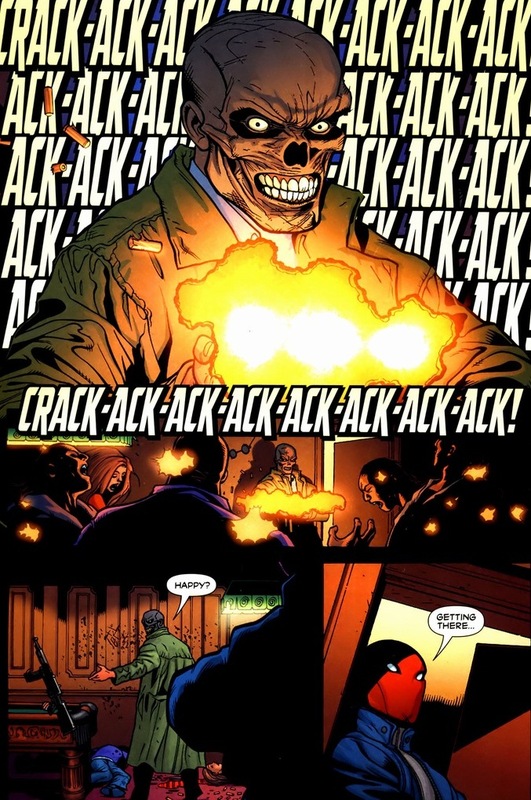 Later, a fire fuses his mask (to disguise his identity) to his face permanently. 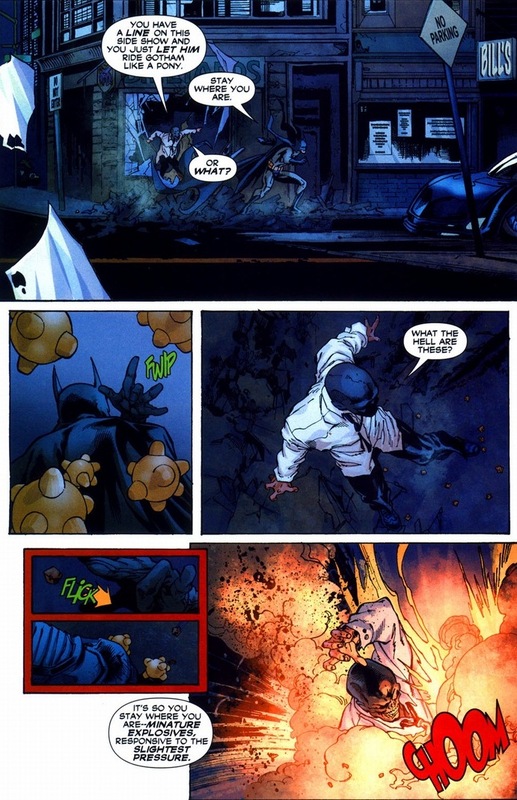 Finally, during the Batman event War Games in 2004, he does some super horrible stuff and secures his place as the most powerful gangster in Gotham. And as you know, villains are just as important as the heroes they fight. More importantly, and the entire reason I’m writing this article, is his rockin’ personality. Yes, he’s a sick, twisted bad guy and I don’t recommend bringing him up during your church dinners or soup kitchen duty, but I became enthralled with his conversations and actions during the Under the Red Hood arcs that took place in Batman #635-41 and #645-50, written by Judd Winick and drawn mainly by Doug Mahnke. We’ll take a look at three of those scenes. 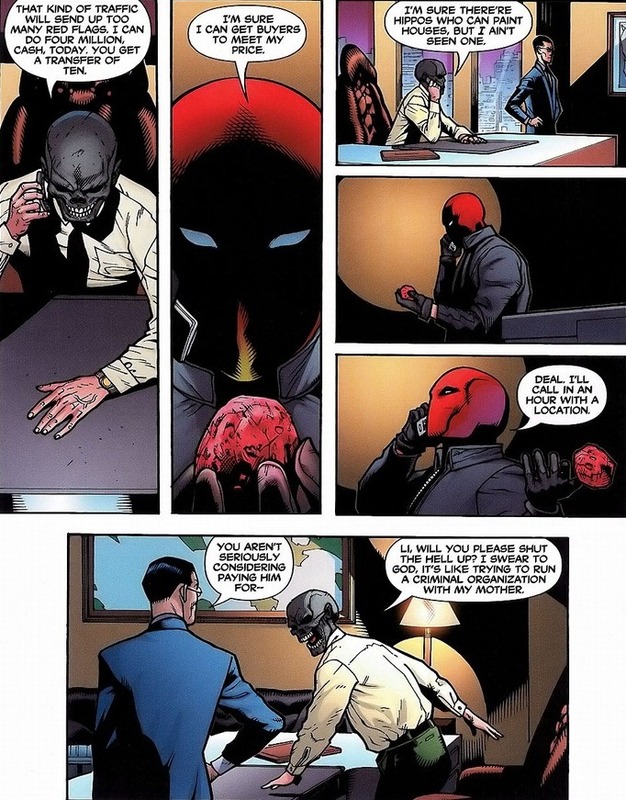 As we read a few of his scenes from the arc, we also have to talk about the Red Hood. 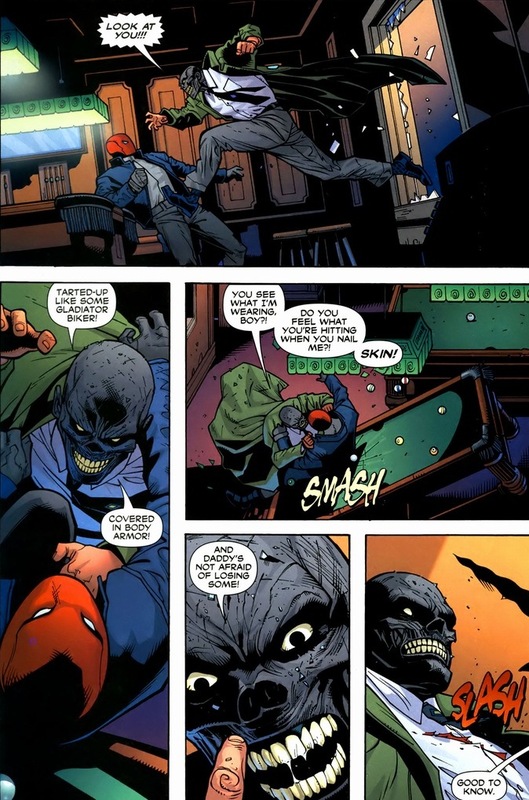 The Red Hood’s an ol’ timey villain introduced in 1951, and actually served as the Joker’s alias for a while. 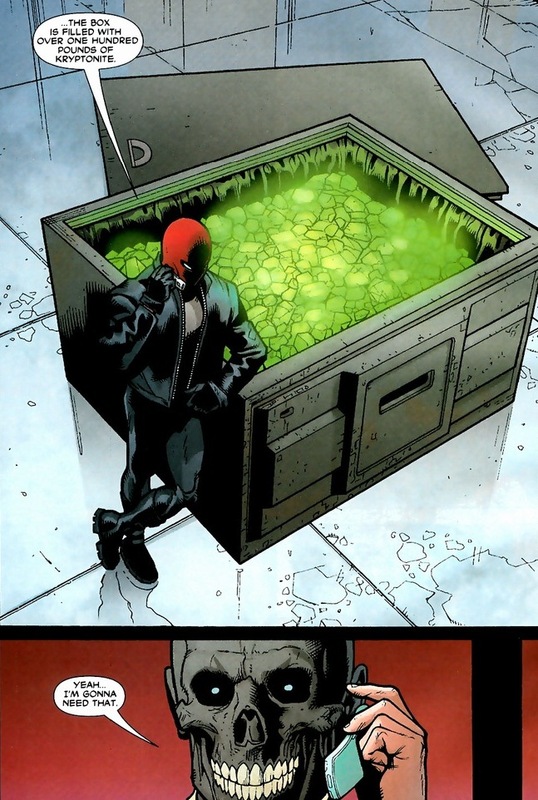 Joker wore his Red Hood costume when he got knocked into the chemical vat by Batman (thus bleaching his skin, turning his hair green, and triggering his latent insanity). 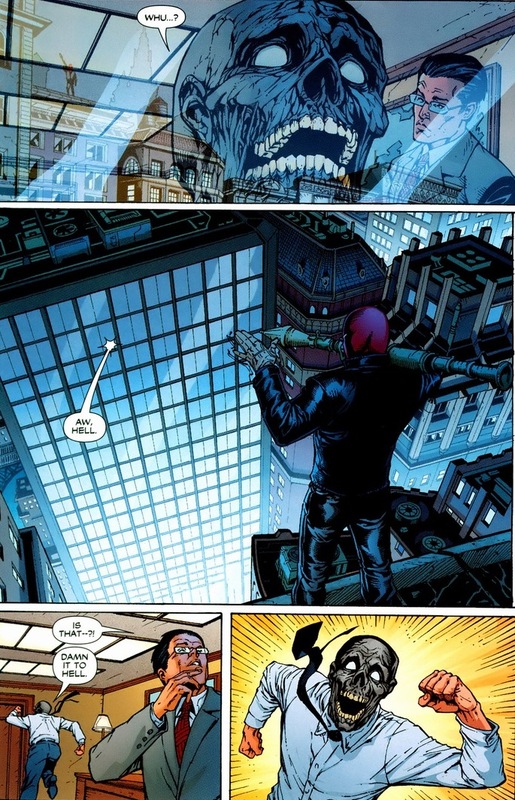 Now, in 2005, the Red Hood suddenly appears again. Since it’s fairly common knowledge at this point, the Red Hood’s identity is revealed to be Jason Todd, the second Robin. Y’know, the Robin who was killed by Joker after a crowbar attack and explosion in 1988. 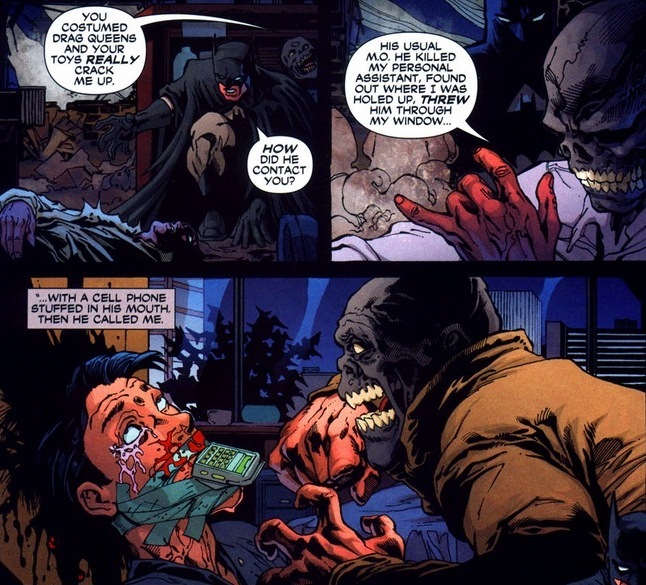 The same Robin who was brought back to life because Superboy-Prime punched a hole in reality. Not a joke. He grew up in hiding, trained in secret, and re-emerged as a full-on supervillain. The same supervillain who’s going to challenge Black Mask for control of his criminal empire. You and I aren’t stupid. No one climbs the bloody mountain to the murderous peak by making deals with fresh faces. 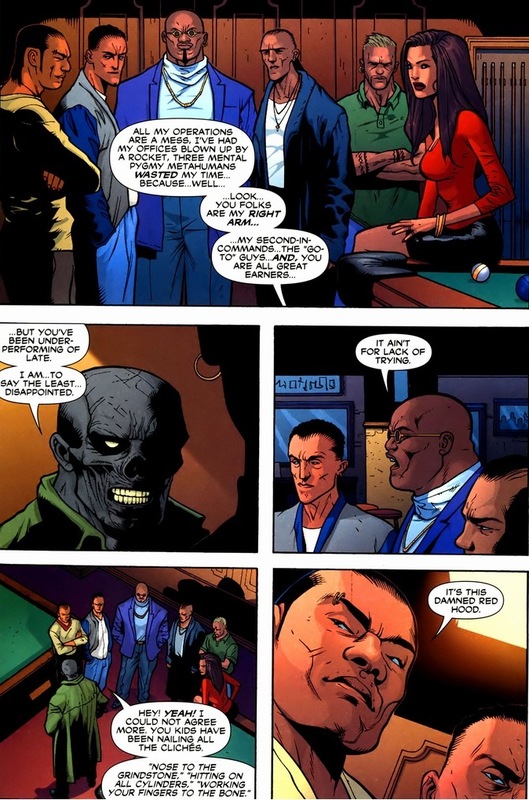 I mean, Black Mask has a reputation of cruelty, even to those trained by Batman and Ra’s al Ghul. 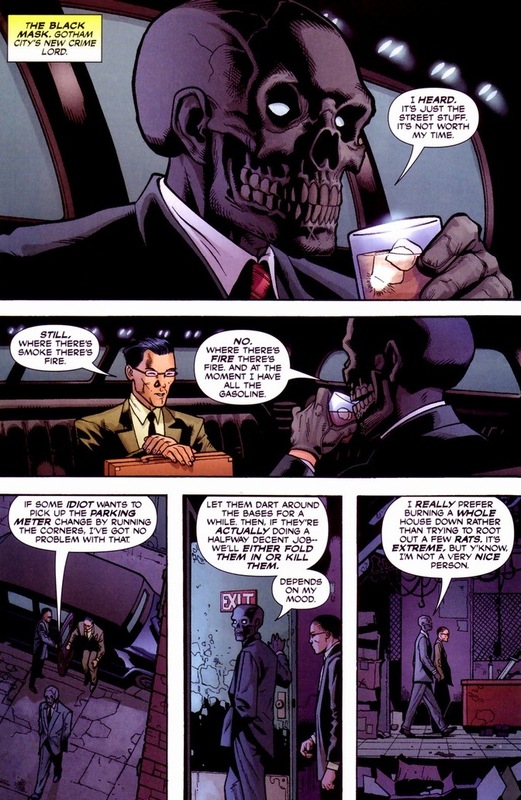 So, being the shrewd businessman, Black Mask finds a way to get his product without having to pay. The Gotham way. 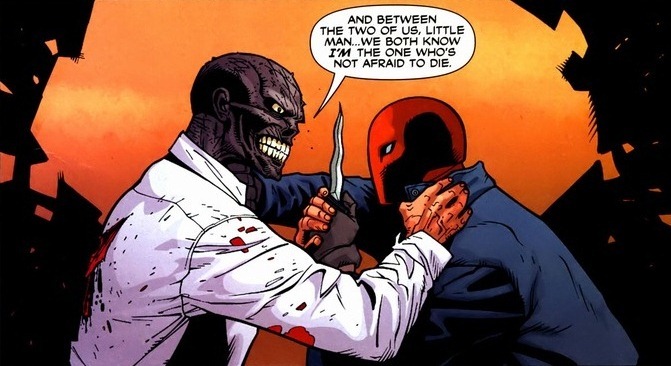 Want to see Jason Todd take on Mr. Freeze? Gotta buy the comic, I’m pushing 30-ish pictures today already. 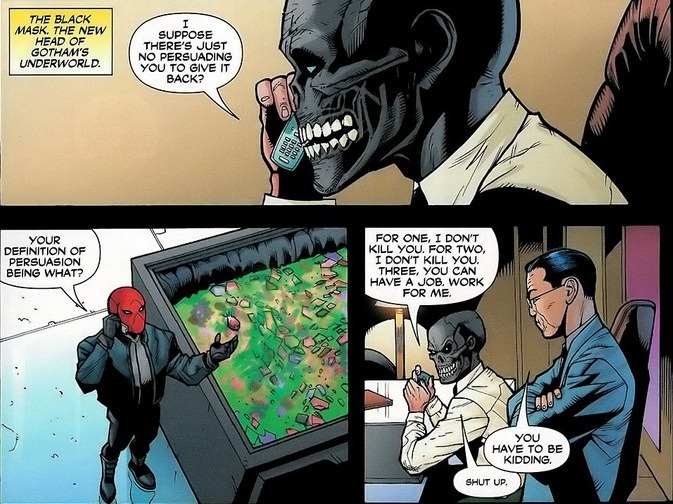 But the war between Black Mask and Red Hood heats up. 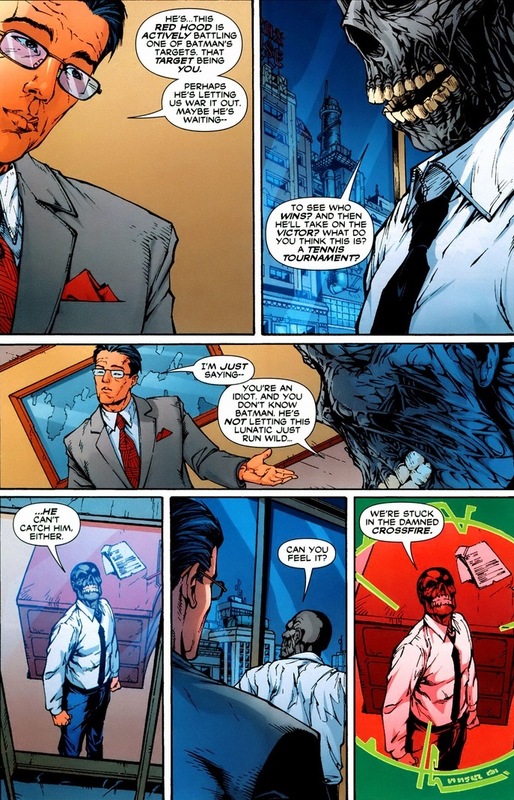 Turns out Jason Todd’s fairly successful at what he does: hostile takeovers of illegal businesses. The joke here is literal. 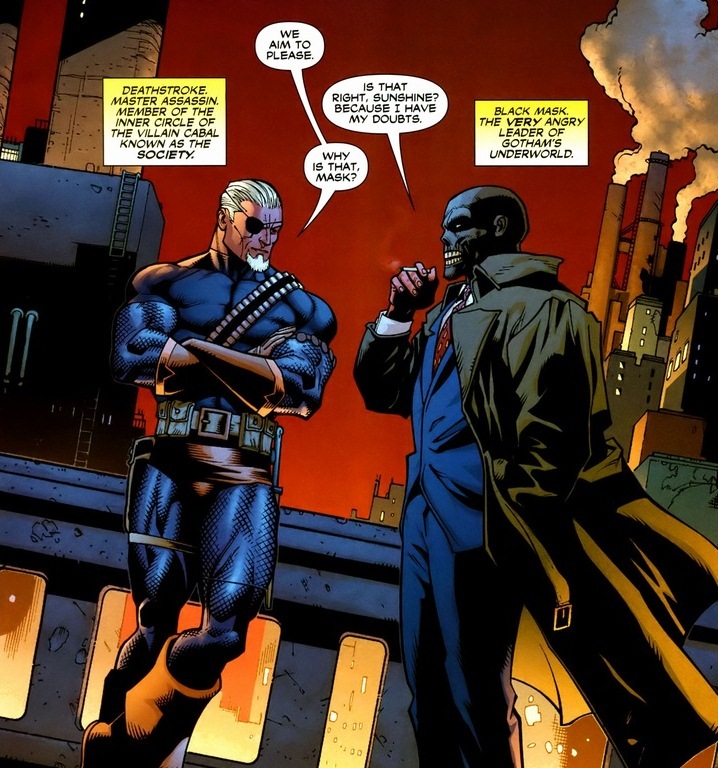 Also, doesn’t it seem surprisingly easy for Gotham’s supervillains to get their hands on really powerful weaponry? 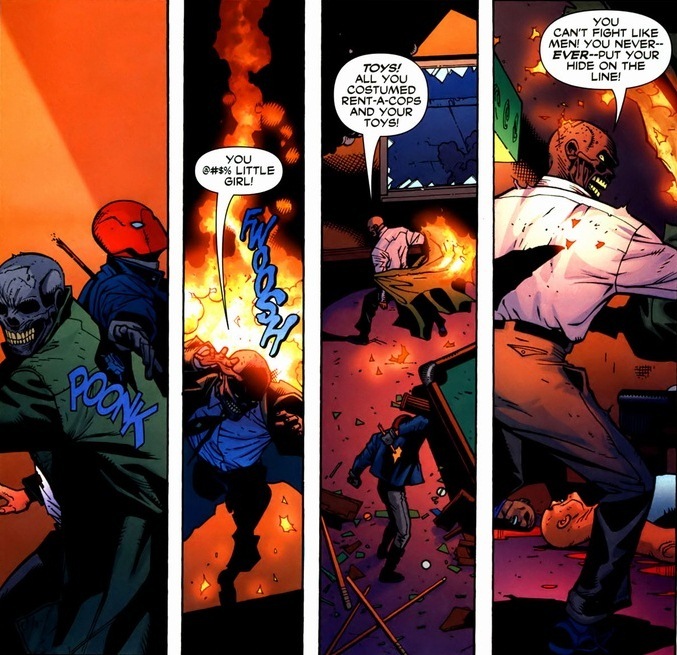 Just because the Red Hood doesn’t have any superpowers doesn’t make him any less dangerous than those who do. 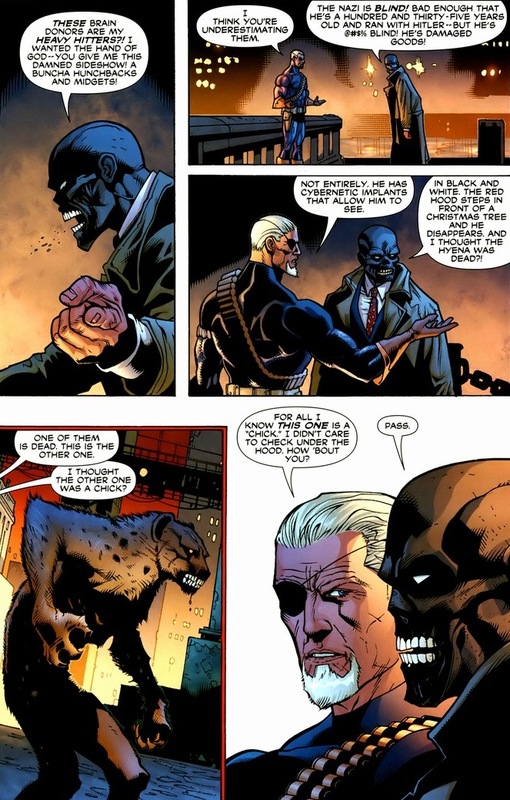 And Black Mask and his goons can’t even put a dent in the guy. Plus, after a dude blows up your office, it’s time to start accepting outside help, and luckily, that outside help comes to him. 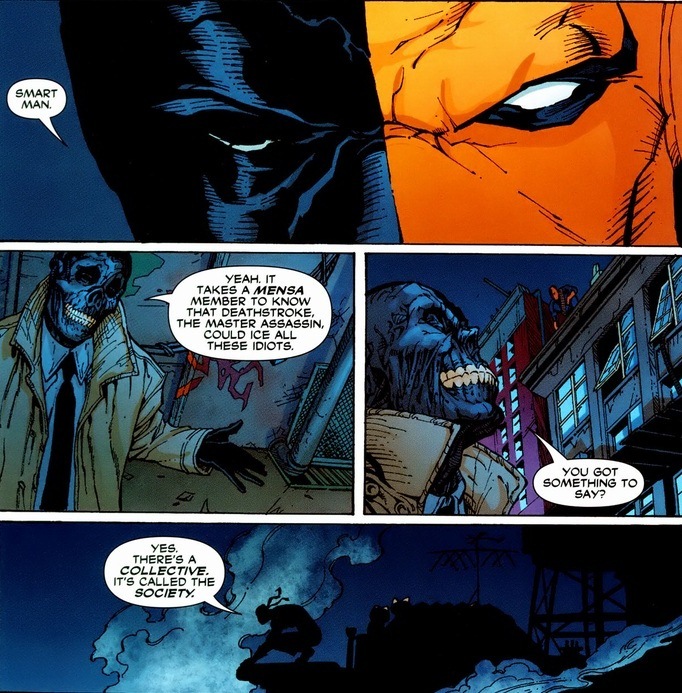 If you don’t know Deathstroke, he’s the assassin who once took on the entire Justice League at once and almost won. I think I’ll show that issue soon. 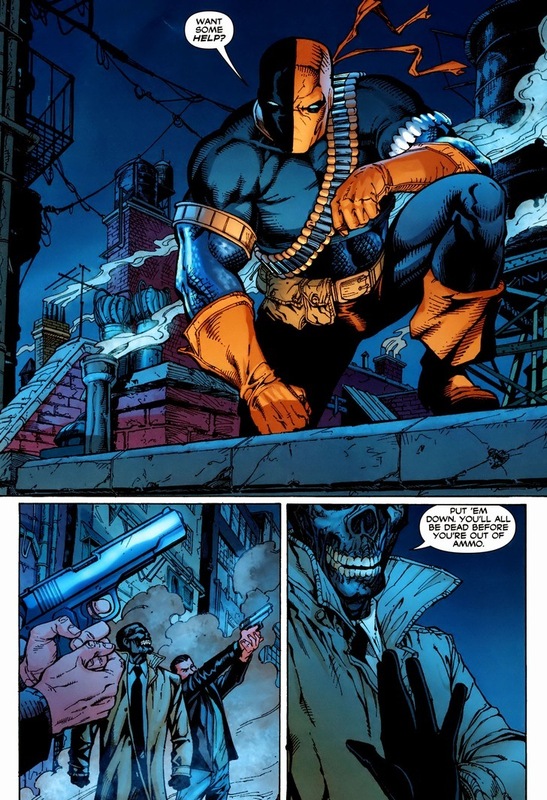 Unfortunately, Deathstroke himself is just the messenger. His skills are way too valuable to take out a former Robin. 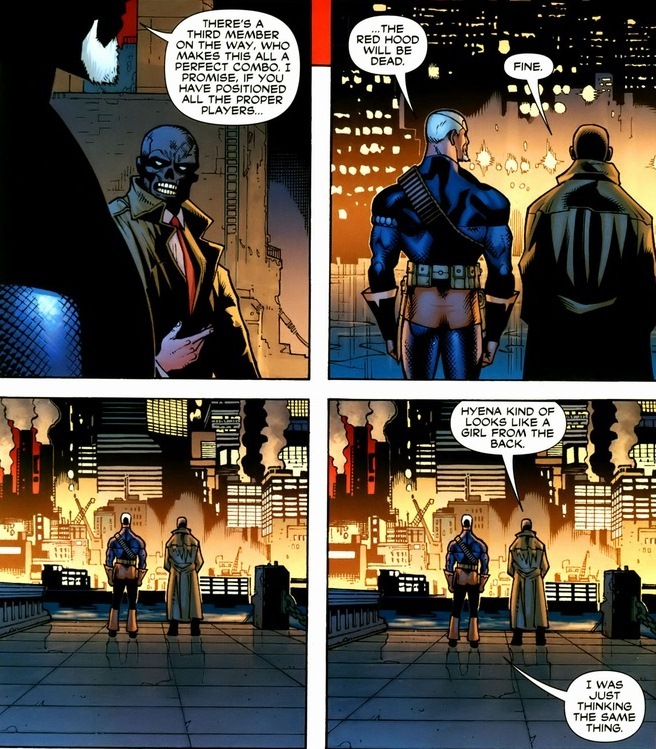 But for the small price of Black Mask’s agreement to become a Society member, the Gotham criminal will get a few supervillains of his own to sick on the boy wonder. 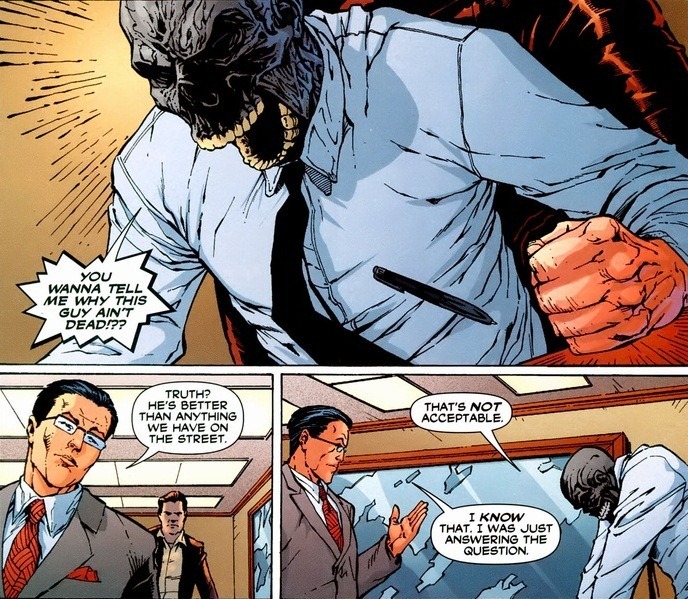 Though to be fair to Black Mask, the supervillains provided aren’t exactly Lex Luthor or Gorilla Grodd caliber. Sometimes it’s just nice to see two deadly, amoral supervillains bond a little bit. 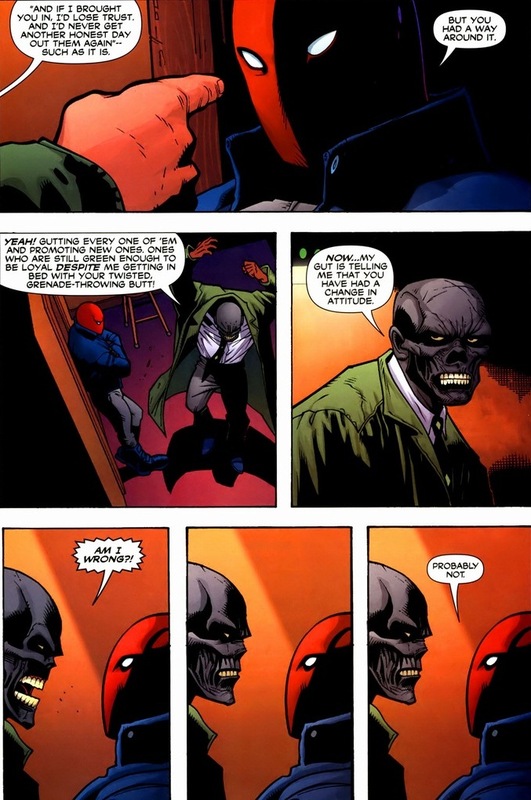 And how do the supervillains do against the Red Hood (and Batman)? You’ll have to read it. 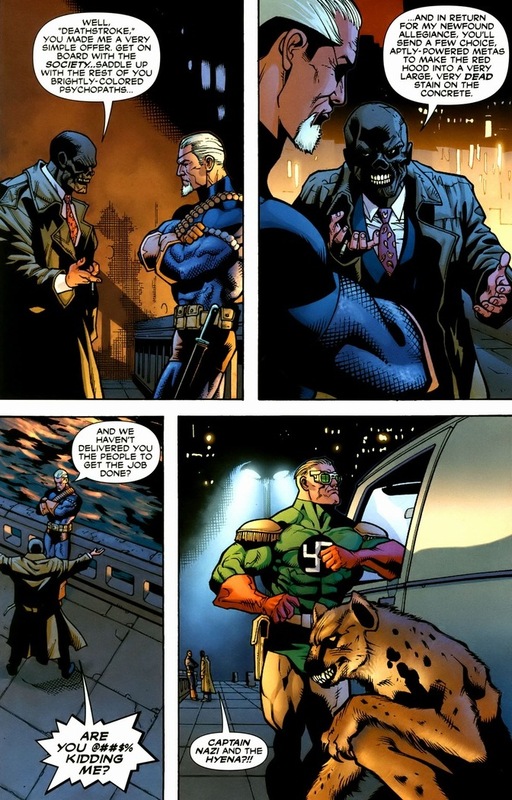 Though in the animated movie of this comic, Captain Nazi and Hyena are nowhere to be seen, sadly. 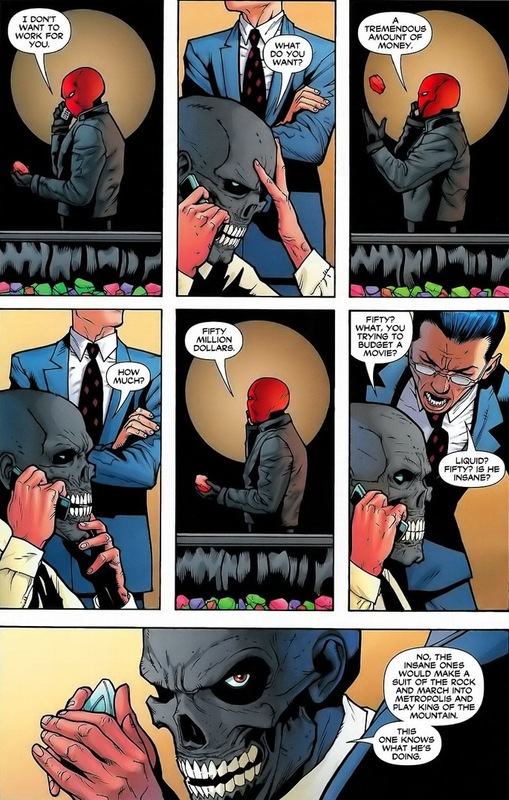 Because this arc takes place over thirteen issues, Black Mask and Red Hood brawl and fight a whole bunch. But never each other, until the final two issues. Which of course starts out innocently enough. And that was the last page of innocence. The battle between the two lasts most of the issue. 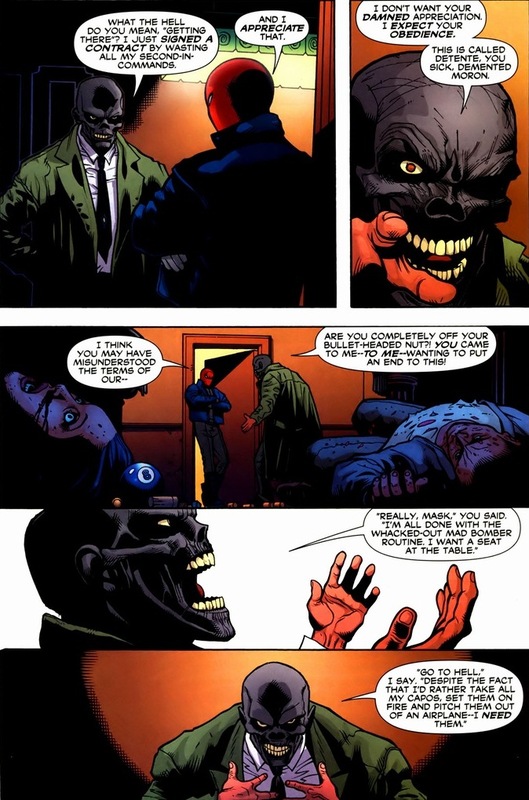 And even though the Red Hood’s a highly trained martial artist, the Black Mask holds his own surprisingly well. 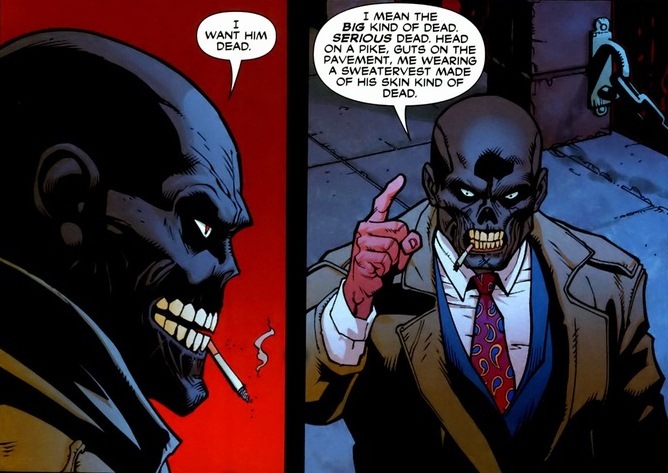 As the two scream and hurl insults/philosophies amid breaking pool cues over each other’s backs, I’ve taken a few choice, super awesome things the Black Mask says to show you. I’m way too good to you. 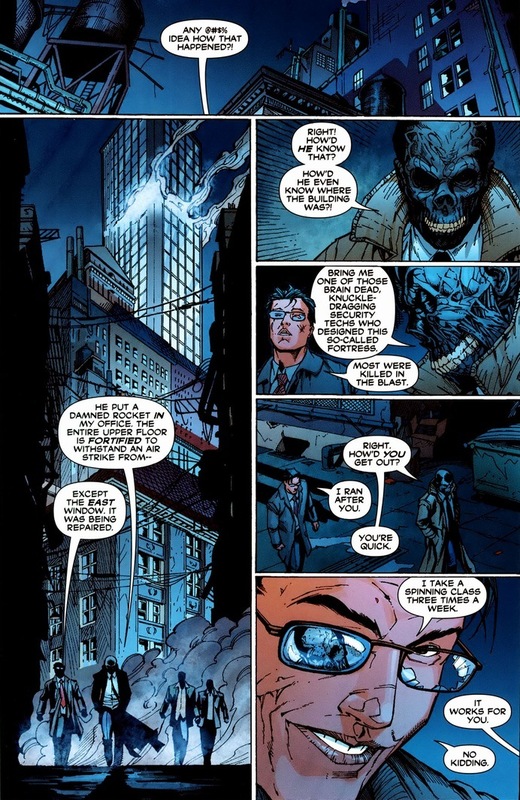 After the fight wraps up (though there’s still two issues after this for the amazing Batman vs. Red Hood finale that the whole arc has been building up to), the Dark Knight himself shows up for mystery solving/clean up. 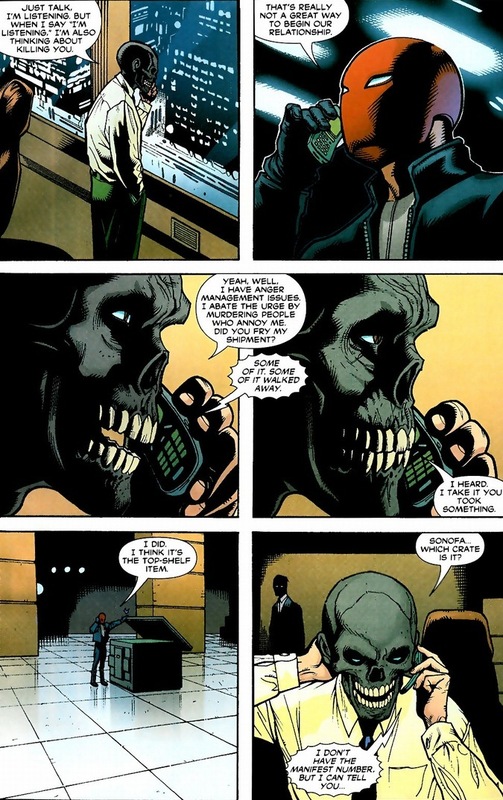 Since Black Mask is a Batman villain, surely it’s important to see the two converse a little. I mean, the series is called Batman. Definitely the most adorable explosives I’ve ever seen, don’t you agree? 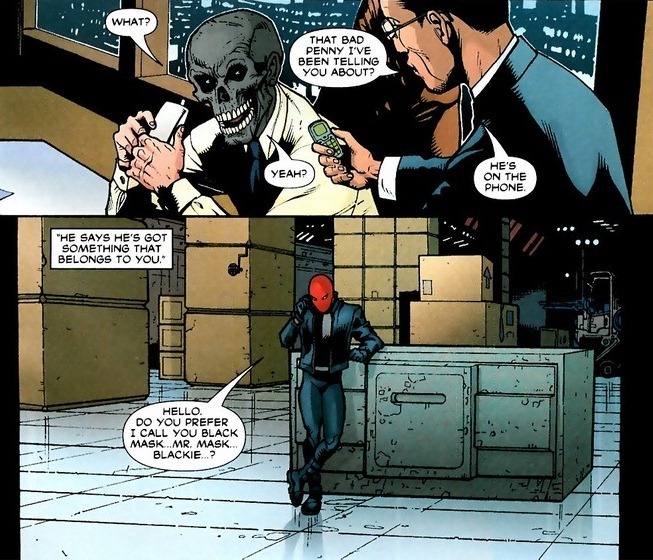 Coupled with a complete lack of fear of Batman and his own smarts, Black Mask totally realizes the truth about the Red Hood. 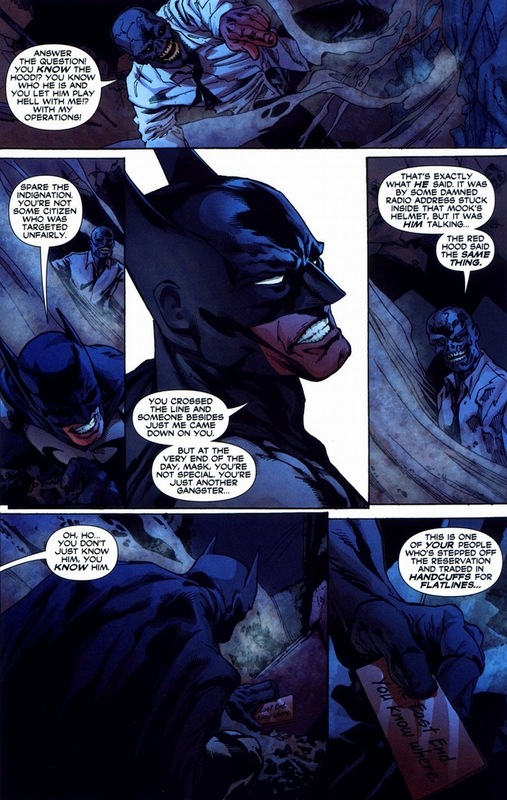 The truth that Batman doesn’t tell family members, much less supervillains. After this debacle, Black Mask’s reign doesn’t last much longer once he targets Catwoman, who tends to be much less forgiving than Batman. And for being a subplot within the main story, he totally rocked it, right? Of course you agree, because you’re also awesome.